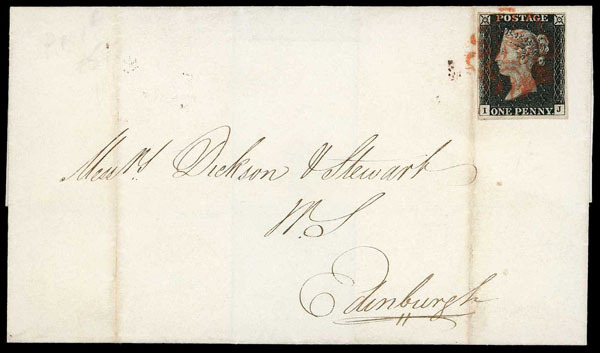 Great Britain, 1840, 1d, Plate 1b to Edinburgh Cover, SG #2, IJ, clear to large margins all around, tied by red Maltese Cross, from Glasgow 11 SEP 1840 and SEP 12 1840 receiver; two vertical cover folds not affecting adhesive, Fine to Very Fine. Great Britain, 1840, 1d Black, SG #2, 4 copies all with red cancels, 4 margins but some tight, one with heavy corner thin, Fine overall. 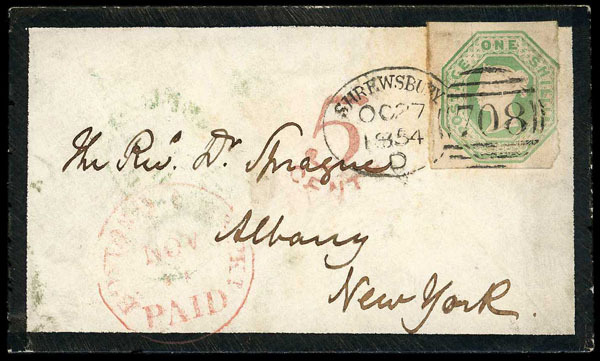 Great Britain, 1847, Queen Victoria (Embossed), 1/- on Cover, 3 margin example tied to petite mourning cover by Shrewsbury, OC 27, 1854 cancel to Albany, New York, canceled "5 CENT" in red and indistinguishable red Nov. paid, Liverpool backstamp, Fine cover. Great Britain, 1902, King Edward VII, De La Rue Printing, ½d to 10/-, o.g. (some h.r. ); 10/- vertical crease, generally Fine to Very Fine. 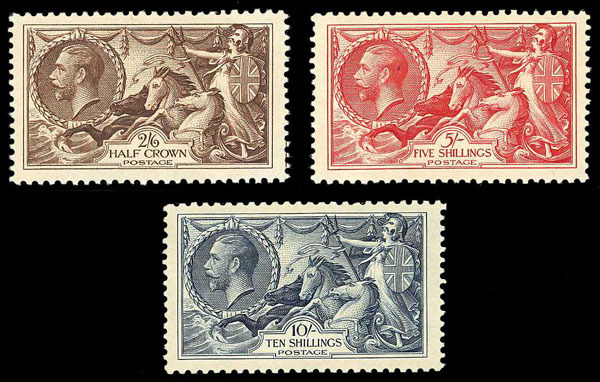 Great Britain, 1934, King George V Re-Engraved "Seahorses", 2/6 to 10/- Complete, o.g., Fine to Very Fine.